← First Beer Can Race Cancelled Due to Weather. 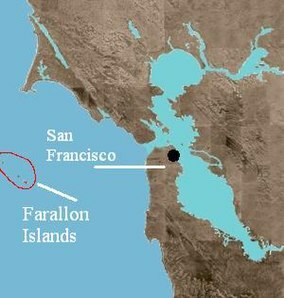 FARALLON ISLANDS, Calif. (KTLA) — One person died and four other people are missing after a boating accident Saturday off the coast of Northern California. The accident occurred during an annual sailboat race around the Farallon Islands, U.S. Coast Guard officials told the Los Angeles Times. The Coast Guard received a mayday call about 3 p.m. from a vessel, reporting another boat had run aground on rocks near the islands. The boat that hit the rocks was a 38-foot sailboat named the Low Speed Chase, the Times reported. A Coast Guard helicopter rescued two people from the rocks. An Air National Guard helicopter rescued another person and recovered the body of a person who drowned, the Times reported. Four more passengers from the Low Speed Chase were sill unaccounted for Sunday. This entry was posted in Uncategorized and tagged bay, bay area, boat, boating, boats, california, coast guard, coyote point, coyote point yacht club, CPYC, farallon, farallon race, low speed chase, national guard, races, racing, regatta, rescue, sail, sailing, san francisco, San Francisco Yacht Club, yacht, yacht club, yachting. Bookmark the permalink.